Modern editions – Droz 1927 (partial edition); Barret 1981 (complete); an online edition by Clemens Goldberg is available at the Goldberg Stiftung. Scholarly literature (selection) – Morelot 1856;Droz 1927; Jeppesen 1927; Plamenac 1971; Barret 1981; Gutiérrez-Denhoff 1985; Higgins 1987; Alden 1999; Alden 2010 - especially the very detailed description in Appendix A (A2 – PDF). Small format parchment chansonnier, c. 17 x 12 cm, 204 folios (of original 206); modern binding in grey suede on heavy cardboard; 26 fascicles; original roman-numeral foliation does not include the first fascicle containing the index (today starting at "ij” on f. 7) and a modern foliation starting at f. 1; pages ruled in red ink for the margin lines and black (now brown) for the staves; 7 staves per page; music and texts in black ink; calligraphic initials in black (brown) ink with varying levels of decoration in fasc. 1–11 (see below); there are no further initials after first opening of fasc. 11, though spaces were left for them. Fasc. 24-26 from the start contained blank, ruled pages only – as extra space for musical additions. The original contents were 157 chansons (1 has disappeared), all copied by the main scribe (the Dijon scribe). At about a fifth of their number he supplied composer ascriptions. Four songs were entered into fascicles 23-25 by later hands (DijonB and DijonC). Before the first fascicle containing music the Dijon scribe has added three bifolios with an index and a short treatise on notation. The songs are ordered in alphabetical groups, in which they then appear in order of appearance. Their placements in the MS are indicated by roman ordinals (evident from the superscript “e”s after the numbers). 152 works are listed (the 1st and 2nd parts of two songs have been listed separately). 11 pieces are missing from the index: five in fascicle 11 (nos. 72–76), no. 136, no. 156, three pieces copied by the second (DijonB, nos. 157–59), and the final song (DijonC, no. 160). Except for two songs (nos. 96 and 127), ordinal references are not given for songs in the second half of the manuscript (from no. 72 onward). In total, 76 pieces have references, and 76 are without. Fasc. 0, ff. 1-6v – index and a short explanation of note values and ligatures added by the Dijon scribe. Fasc. 1, ff. 7-11v – one bifolium is missing. 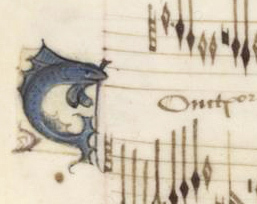 This causes the loss of Ockeghem’s »Prenez sur moy«, which according to the index opened the chansonnier. Moreover, the loss has left three songs incomplete, the widely circulated »J’ay pris amours« (no. 1) and two unique songs, »Ung seul baisier m’a secours« and »Pour vostre amour« (nos. 6-7). Fasc. 12, ff. 92-99v – from fasc. 12 onward there is a change in the type of parchment used. Fasc. 20, ff. 156-163v – the last page (f. 163v) contains blank staves only. Fasc. 21, ff. 164-171v – the first and last pages (ff. 164 and 171v) contain blank staves only. Fasc. 22, ff. 172-179v – the first page (f. 172) contains blank staves only. Fasc. 23, ff. 180-187v – the last page (f. 187v) originally contained blank staves only. Hand DijonB added three songs (nos. 157-159), ff. 187v-192. Fasc. 24, ff. 188-195v – fascicles 24-25 originally contained blank staves only. Fasc. 25, ff. 196-203v – Hand DijonC added one song on the last opening (no. 160), ff. 202v-203. Ff. 7-19v (fasc. 1-2) – a) fully painted (see example 1). Ff. 20-30v – b) letters with unpainted decorations (see example 2). Ff. 31-32v – as b) but the yellow backgrounds and some shadings are painted in. Ff. 33-38v – as b). Ff. 39-41 – c) letters only (see example 3). Ff. 41v-44v – as b). Ff. 45-51v – as c). Ff. 52-59v (fasc. 7) – as a). Ff. 60-75v – as c). Ff. 76-83v (fasc. 10) – as a); the initials on the central bifolium (ff. 79-80v) was drawn and painted by a different artist (see examples 4a-b). Ff. 84-85 – as c). Ff. 85v-end – no initials, only spaces left for initials. The initials are painted on a yellow background, and the designs include grotesque faces and figures, courtly as well as common, lovers and obscene figures, hybrid creatures and various animals, birds, snails, fish and insects, musical instruments and flowers. The painter has completed the initials in fascicles 1-2, 7 and 10 only, the remainder was left in various stages of completion. 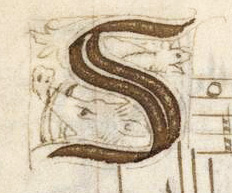 The draftsman of the initials has skipped the middle bifolium of fascicle 10, so the painter has drawn his own letters in the same style, but thinner and more elegant; in some cases he has formed the letters by the decorative figures themselves, similar to the initials in the Copenhagen and Wolfenbüttel chansonniers. The genesis of the MS has been extensively researched by Jane Alden (see the detailed report in Alden 2010, especially pp. 93-107). Her reconstruction is based on a careful analysis of the fascicles combined with an examination of the temporal variations in the scribe’s handwriting. 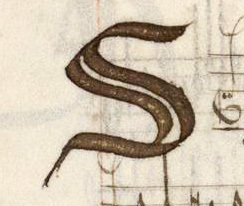 The MS was surely conceived as a normal size chansonnier of 11 fascicles plus one or more empty fascicles for expansions, and it was commissioned by a wealthy patron. The repertory was copied and the loose fascicles sent for decoration. Then the project suddenly stopped, probably for lack of funding for the full decoration, and the half-finished fascicles were returned to the scribe. However, fascicle 11, which had music on its first three pages only (belonging to Busnoys’ four-part »En tous les lieux ou j’ay este« (no. 71), which bridged fasc. 10-11), were mislaid and only came to light much later. Apparently while looking for a prospective buyer of the MS, the scribe decided to expand the MS to make it more attractive, thereby doubling its size. He had the contents carefully planned, and he nearly completed the copying of the now 24 fascicles – fasc. 11 was still absent. He then added the short explanation of mensural notation and the index, which lists the contents of the new second part of the MS, but omits the references to their placements because of the insecurity stemming from the missing fascicle. Next he became involved in the finishing and expanding of another chansonnier, the Laborde (see the description). The destiny of this chansonnier too was to remain a torso, and it probably stayed in his possession alongside the Dijon chansonnier. On the other hand, a much smaller chansonnier, Copenhagen (see the description), was finished and delivered. During these years he may have produced and delivered a great many of such chansonniers, which have since disappeared; his workmanship and musical expertise is obvious. At some point, the Dijon scribe regained the missing fascicle, incorporated it in his own chansonnier and filled the empty pages in it and at two other places in the MS (nos. 72-76, 136 and 156), but did not enter the new repertory into the index. 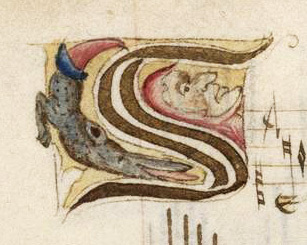 In this shape the unfinished chansonnier passed to the workshop of the scribe of Florence 2794 and his successors, a workshop with close connections with the French court chapel. Here it was foliated and three songs were added by the scribe DijonB who can be identified as the second scribe of Florence 2794 (see further Christoffersen 2012). From this workshop it probably went to its first owner and user. The Dijon chansonnier does not contain any inscriptions, which can help to identify the original owner. For detailed information on the copying, decoration, inscriptions and later provenance, see Alden 2010, Appendix A2. Jane Alden’s close examination of the variations found in the handwriting of the Dijon scribe (Alden 2010, pp. 97-107) reveals that enough time had passed between two phases of his work to produce significant differences in his preferred way of forming certain letters. The late development of his writing can be found in his additions to the Laborde chansonnier, in his addition of the last seven songs in Dijon (in fasc. 11 and other places, see above), and in the Copenhagen chansonnier. We have been able – tentatively – to date his taking over of the chansonnier project from the Laborde scribe around 1471, maybe e little later. This means that the bulk of the Dijon chansonnier must be dated earlier, probably to the last years of the 1460s to around 1470 to allow time for the differences in his writing to develop. This is furthermore consistent with his unawareness of the music of the young Philippe Basiron, which helps to date the Laborde and Wolfenbüttel chansonniers. This type of music only appears in his work on the Copenhagen chansonnier (see further my article ‘The chansons of Basiron’s youth and the dating of the ‘Loire Valley’ chansonniers’). His expansion of the Laborde chansonnier and the failed attempts at getting it delivered and paid in full may have occurred during the years 1472-74, and his addition of the last songs to the Dijon chansonnier and the creation of the small Copenhagen chansonnier must probably be placed at the end of this period. The Dijon scribe’s expectation of a commercial success with the two big chansonniers in his care came to nothing, they remained in his possession for some years, unfinished and unbound. Finally, they were handed over to a new workshop, that of the scribe of Florence 2794. Here both manuscripts were quickly finished and bound and both of them dispatched to owners – presumably at a discount price. This part of their early history may be placed in the years 1477-79 (cf. 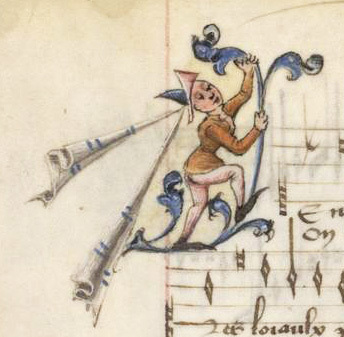 my article ‘The French musical manuscript in Florence, Biblioteca Riccardiana, Ms. 2794, and the ‘Loire Valley’ chansonniers’). These datings reverse the sequence of events sketched in Alden 2010, pp. 125-126. I find that the Nivelle and Dijon chansonniers probably are the earliest, begun during the last years of the 1460s, while Laborde and Wolfenbüttel enter the picture a short time later. Datings in the musicological literature: Jeppesen 1927, 1470-1480; Perkins 1979, early 1470s; Gutiérrez-Denhoff 1985, Dijon scribe c. 1465-1475, hands B-C 1480s; Alden 2010, Dijon scribe c. 1465-1470s, hand B 1480s, Hand C 1490s.